This little gem of a demo was quite an interesting find for me. I've always been a huge supporter of women in heavy metal, and feel they make some of the most significant contributions to the genre. So when I stumbled upon Kamala, a very new all-girl metal outfit from Finland, I just had to learn more. 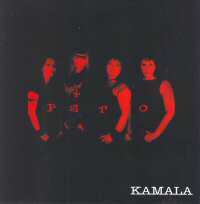 Founded in 2005 as a foursome, they released their debut demo Peto in June of the following year. While bands such as Kittie may come to mind when thinking of a comparison point, and musically that would be an accurate association, Kamala differs significantly in the vocal department. Frontwoman Karita sings cleanly, though quite aggressively, and the lyrics are entirely in Finnish. Of the three tracks on Peto (which translates to "beast"), the lead-off song "Akana" is the best of the bunch. All three are actually quite alike, but the band is at their best as the demo gets started. Besides angrily belting out the lyrics, Karita lays down some chunky riffs that are, with the help of bassist Emilia, truly bottom-heavy. Behind the kit, Päivi is a wild woman and drives the pace relentlessly. The tone on "Akana" is angry, fast, and in your face. This carries over to the other two tracks and makes for a good, yet too quick, listen. The word Kamala means "awful" in Finnish, but nothing could be further from the truth when describing these talented girls. The only thing that would keep them from success in America is the language barrier, but any fan who truly appreciates solid metal will still enjoy the music of Kamala. I certainly do.